Happy weekend to you all! Looking forward to sharing this A England beauty with you! 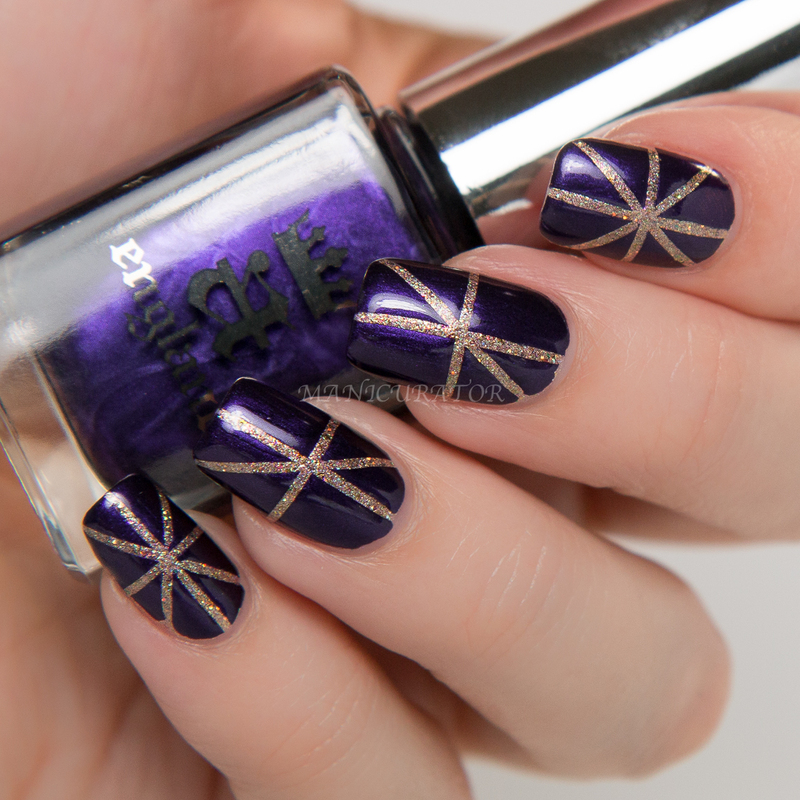 I've never met an A England polish that didn't apply with utmost perfection and this is no exception. The newest addition to the Heavenly Quotes Collection is The Blessed Damozel. This shade wanted so much to photograph blue, so I had to do some color correcting in the editing process. I've done my best to make it color accurate. My base color here is the amazing Glam Polish Deceptive Practice from the Masters of Illusion Collection. 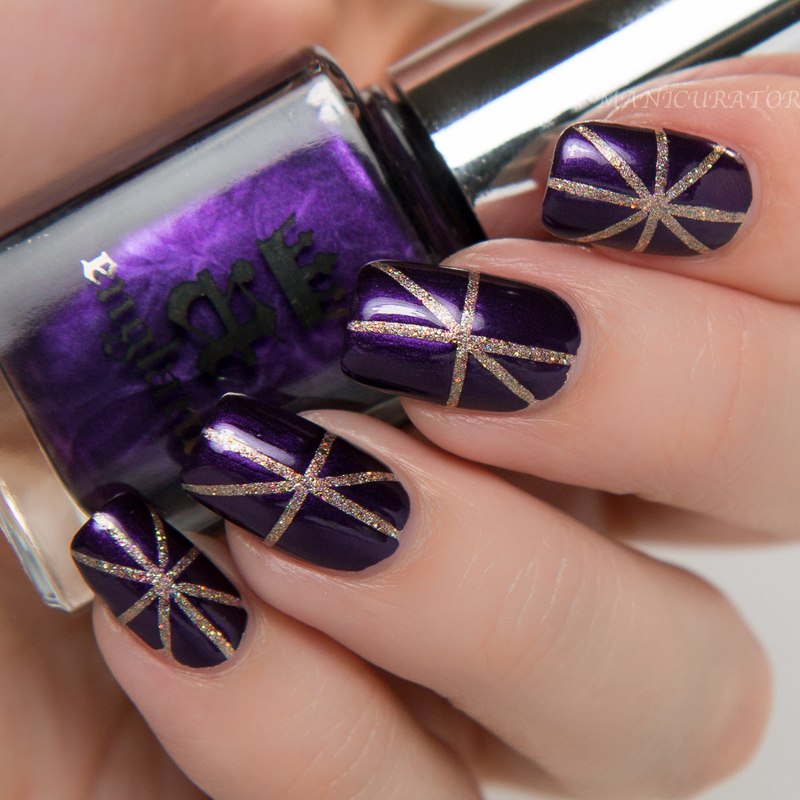 If it's not obvious, I used striping tape once the Glam Polish was dry to create the design. What you see is ONE coat of A England The Blessed Damozel. Another simple but striking nail design if you ask me. I love these shades together. So royal looking, right? A England can be purchased at a-england.co.uk and other online sellers. I love the polish and I love the design! I also think that a lot of gorgeous purple shades turn blue when photographing them. Color correcting is almost always necessary! Can you believe that I have never had any A-England?! Gotta change that :) What a beautiful color and it looks perfect with the golden glitter. Beautiful. Elegant. Stunning. Looks like it would be a good polish to stamp with too? Beautiful shade and lovely combo! I love the two colors together, so stunning!